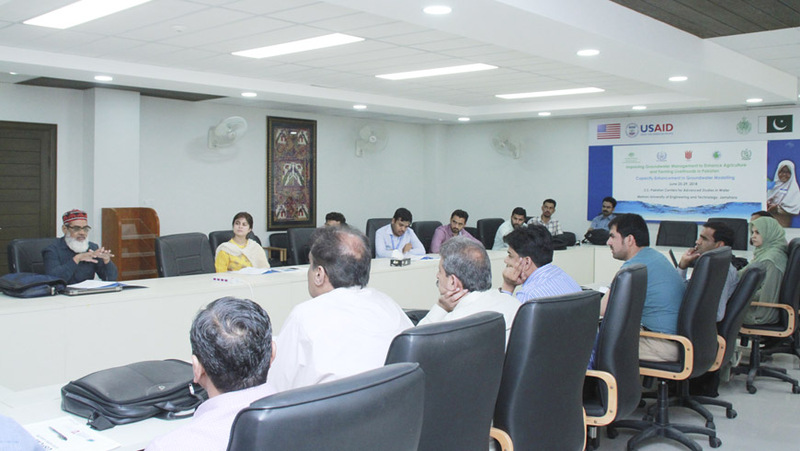 Five-Day Training Workshop on Improving Groundwater Management and Groundwater Modelling kicked off at U.S.-Pakistan Center for Advanced Studies in Water (USPCAS-W) Mehran University of Engineering and Technology (MUET), Jamshoro on Monday. 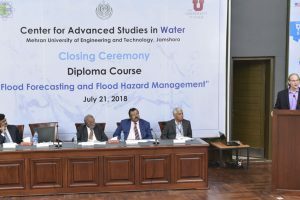 In the inaugural session, Dr. Abdul Latif Qureshi, Professor and sectional head of Hydraulics Irrigation and Drainage (HID), USPCAS-W MUET welcomed the participants and said that the training workshop will help the participants to design the conceptual model and to review of modeling flow packages used to construct a groundwater model for Sindh, Punjab and Balochistan site areas. Dr. Qureshi warned that the extraction of groundwater would cause the deterioration of water quality and quantity. He further said that salinity, as well as the rapid depletion of groundwater, affected farming and livelihoods of Pakistan’s people. On this occasion, Dr. Jehangir F. Punthakey, the project coordinator said that five-day training workshop is part of a four-year project on Improving Ground Water Management to Enhance Agriculture and Farming Livelihood in Pakistan signed by the Australian Government through the Australian Centre for International Agricultural Research (ACIAR) and Charles Sturt University (CSU), Australia, with twelve implementing partners from Pakistan including MUET, Pakistan Council of Research in Water Resources (PCRWR), Sindh Agriculture University (SAU) Tandojam, University of Agriculture Faisalabad (UAF), NED University Karachi, Arid Agriculture University Rawalpindi, Balochistan University of Information Technology, Engineering and Management Sciences (BUITEMS) Quetta, the provincial irrigation departments of Punjab, Sindh and Balochistan, WAPDA and others. 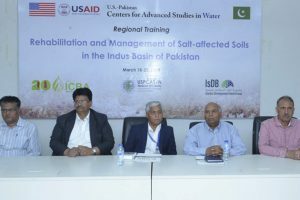 Dr. Punthakey said that the project focuses on different canals and basins of Pakistan where the groundwater data analysis and modelling will be done in Pishin Lora Basin (PLB) of Balochistan, Rohri Canal at Shaheed Benazirabadand Naushehro Feroze Districts of Nawabshah Division of Sindh province and in the Lower Bari Doab Canal (LBDC) of Punjab. He further said that through this Australian government-funded project, the groundwater management would be significantly improved through capacity building of stakeholders and the farming community. 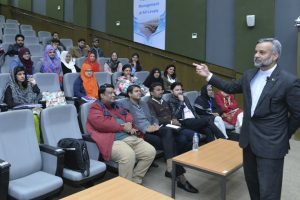 Around 20 participants from the implementation partners and students of USPCAS-W MUET participated in the workshop and will also visit Kazi Ahmed, Shaheed Benazirabad for their field assignment. Dr. Usman Khalid Awan from ICARDA, Mr. Naveed Iqbal, Deputy Director PCRWR, Dr. Muhammad Shafqat Ejaz from NED University Karachi, Mr. Waqas Ahmed, Assistant Professor USPCAS-W MUET was among the trainers of the workshop to train the participants throughout the five-day workshop and also in the field visit.